The Kush Marketplace is still getting busier and busier. Stay organized and don’t let things slip through the cracks! Here are a few tips that will help you succeed and close deals over the platform. Lack of Communication is one of the biggest factors with deals that fall through in the wholesale marketplace. Once an offer is accepted over the platform the work is not over.. Delivery confirmations and preferred payment methods still need to be discussed. Things can come up like inclement weather, road closures, and other unforeseen emergencies that delay/cancel an order. This is why everybody needs to have better communication throughout the entire deal closing process. Quick correspondence in this competitive market is crucial. And remember this is a competitive market! If a buyer asks too many questions or is slow to nail down a delivery date, another eager buyer could be around the corner. Same can be said for sellers that take too long to prepare and ship orders. To ensure your deals close try to call and speak with your buyer/seller the day your introduced. After our docusigns are completed and your introduced, reach out right away to establish a timeline for the deal. If you can organize early then there’s little reason for a deal to go wrong, but if you wait a few days to reach out it might already be too late! You are 3.5 times more likely to get an offer if your post contains a picture. 3.5 TIMES!!! Ads without pictures also spend more time in conversations about “what does it look like? Can I get pics?”. If your ‘conversations’ page is flooding with questions instead of offers, then this could be the easiest fix. High-Quality photos are a must to sell anything these days. Just remember a picture is worth a thousand words, but your pictures should be a representative of what transit is picking up. If you are posting a picture from a photo shoot, that’s cool but please, add what the actual product looks like as well. This will help avoid Returns & Rejections. Posting a picture with your ad is simple, but you can also upload the pictures directly from your conversation with a buyer. As you go to write back to a buyer that asked for pictures, instead just hit the ‘Edit Product’ button and upload the pictures directly to your product. Not only will this buyer get what they need, but all the buyers on the platform will get to see the updated info. A very common mistake made by sellers is making multiple listings for the same general product. 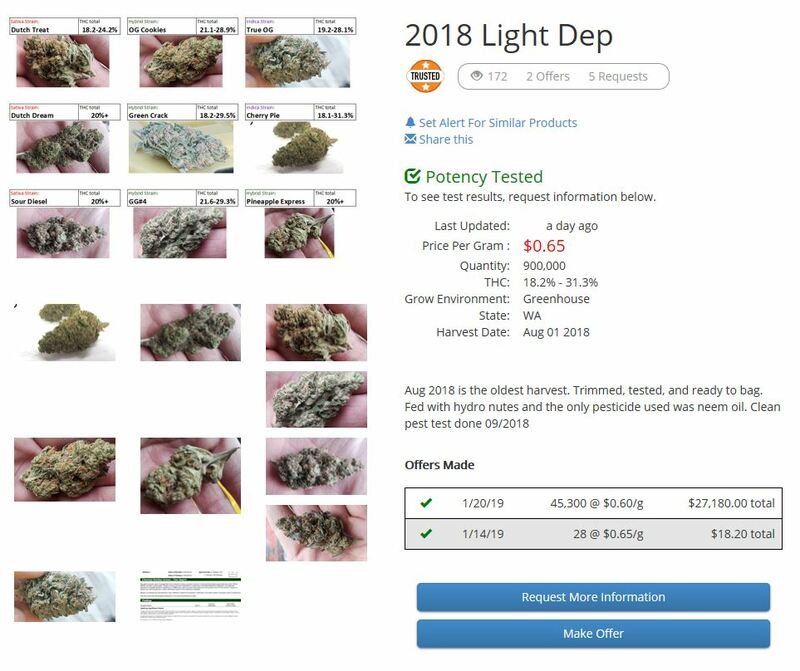 If you have a variety of strains that your farm is offering, put a detailed strain list in the description and strain labeled photos. This will eliminate wasted time on frequently asked questions about your product, and give buyers one place to go for all of your buds. Having individual ads might spread your exposure but condensing your product tends to get much more offers (and even bigger orders since the availability will be larger). It’s a one-stop shop. Buyers want the convenience to see what’s available all in one place. In the description area list the strain(s), THC range if tested, and weight per strain. The more information given gets you closer to the sale. Many times, buyers won’t engage if they have to ask too many questions so try to think like a buyer and answer everything up front. The best strategy would be one solid ad with details on all the similar product available. Here’s an example of one of our most successful flower ads right now, which has helped the seller reach 6 figures in sales over the marketplace this winter. In this post they listed the strains within a picture containing the bud close-ups as well as the test results available. If your a buyer, there’s little to ask! When you are on the Kush Marketplace, you’re dealing with REAL people and REAL businesses. Be mindful when making or accepting offers, and how you fulfill orders. If you can’t accept/fulfill an order, please let Kush and the other party involved know as soon as possible. We are here to help! One issue we have been seeing in the past few months is the ‘Shotgun’ approach to buying. Some buyers will come on the site and make large offers for all the product that fits their general needs. Then once multiple offers have been accpeted, and parties are introduced, the buyer will pick and choose which option to actually purchase. For a seller this is a nightmare! We at Kush are looking into ways to solve this problem, but in the mean time communication will be key. If your a buyer using this approach, try to keep the sellers and Kush informed of your intentions. And if your a seller, still try to call your buyer the day your introduced to see if they mean business.